The little league pre-game plate meeting with the umpires, managers, and player captains should be brief and friendly. The purpose of the meeting is to verify lineups, cover ground rules, and establish expectations for the game. At 5 minutes prior to game time the umpire crew chief (usually the plate umpire) calls the managers to the home plate area for the pre-game meeting. Crew chief stands behind home plate, base umpire on the opposite site of home plate, and the managers and their player captains stand in their respective batters boxes. Lineups: Take the home team manager’s lineup and verify that there aren’t any duplicate entries or missing players. Make sure the player’s number and last name are on the lineups. Confirm the starting pitcher and catcher with the manager. Give a copy of the home team lineup to the visiting manager. Do the same with the visiting manager’s lineup. Equipment: Safety is the umpire’s top-most priority. Ask both managers “are your players equipped according to the requirements of Little League Baseball”? This question asks the managers if all players are wearing a cup. Be sure to get a verbal response before proceeding. Ground Rules: Discuss any specific ground rules for the field. Some fields may have odd outfield fences or overhanging trees and you must get clarity on what the local rules are for these situations usually from the home team manager. Sometimes the first and third baselines are not perfectly straight. Now is the time to tell each manager that you are working with the lines as they lay. Sportsmanship: Ask managers and players to keep all comments positive and to remain in their dugouts during the game unless ‘time’ has been granted. It is also recommended that you tell each manager that there is a 1 minute time limit between innings. The minute begins when the 3rd out is made in the prior half-inning. The pace of the game is really important and it is the umpire’s job to keep the game moving along. 1. Confirm your game's umpires before each game. The day before each game, the home team manager should contact the manager of the team who has been assigned to provide umpires for your game. For example, if the AAA Orioles are the home team for Saturday's game and the AA Tigers are scheduled to provide umpires for the Saturday AAA Orioles game, the AAA Orioles manager must call the AA Tigers manager to confirm that umpires will be provided. Don't send an e-mail or make a phone call without receiving a response, be certain that your games will be covered. Some of the games are assigned to specific people. These are either District 30 umpires or other experienced umpires who have agreed to help us out. I will confirm with these individuals prior to their games. However, you will see that some of these guys have been assigned partners from one of our teams. Be sure to contact the manager of that team prior to your game. If no umps show up, ask for volunteers. If no umpires show up for your game, the 2 managers may decide whether or not to play the game anyway with 2 umpires from the crowd, 1 from each team. Obviously this is not an ideal situation but at least the kids can play and the game will be official. 2. Return all gear you borrow! The umpire room is stocked with all of the equipment you will need as an umpire, feel free to borrow these items for your games. Small items such as indicators, red flags and hats tend to walk away so please do your best to make sure they are returned to the umpire room after your game. Please check your closets and gear bags for equipment that needs to be returned. Questions? 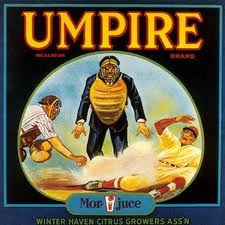 Contact our Umpire in Chief from the board member page.